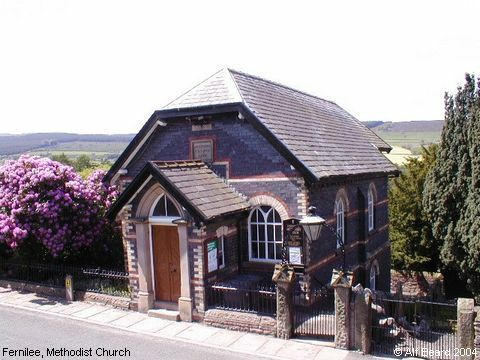 Kelly's Directory of 1932 says this little chapel was built in 1871, and has 290 sittings. It is set into a hillside overlooking the Goyt River valley, and as with many hillside chapels, exploits the slope of the land by having a basement level, visible from the major road running closer to the valley (A5004). It is now a Listed Building. Kelly also mentions that Fernilee has a park opened in 1923, which is a memorial to the men of the parish who died in WWI. Fernilee Methodist Church belongs to Whaley Bridge Uniting Partnership - “three Christian congregations seeking to embody and share the love of God in the neighbourhoods of Whaley Bridge, Fernilee and Kettleshulme”, respectively Whaley Bridge Uniting Church, Fernilee Methodist Church and Kettleshulme Chapel. It can be reached by turning right into Folds Lane off the A5004 travelling north, and turning right at the T-junction. Image contributed by Alf Beard on 9th June 2004.